Champagne Italian pearlescent cardstock. 105 lb weight, 8.5x11 inches. You can print 4 maps or reception cards per sheet. You print and cut from letter-sized cardstock, or we print and deliver finished size. Be sure to click the proper radio button to select printing options. 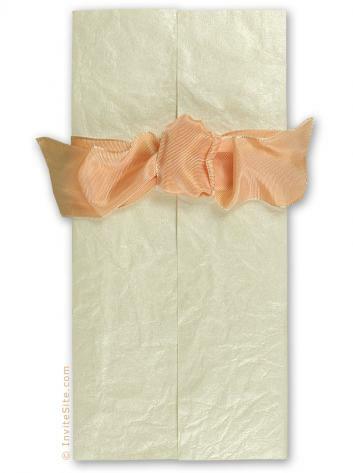 *****DISCONTINUED****** French wired ribbon in a shimmery apricot finishes off this glamourous wedding invitation. (Named after the beautiful character from the Napoleonic period in France.) Tall and statuesque! Tall + Sophisticated Gatefold Invitation made from lustrous papers -- all having a subtle sheen. Handmade paper wrapper and champagne pearlescent invitation card, rsvp card, and envelopes. Closes with wired french ribbon. PAPER FACTS: Wrapper is made from recycled cotton rag, made by hand in India. Invite paper and envelopes are made from FSC certified paper, made without metal or foils, is recyclable, biodegradable, elemental chlorine free. These papers are made in Italy. Finished invitation measures 9-1/2 x 4-3/4 inches. Pearlescent handmade (cotton-rag) paper wrapper, with a crinkle texture. (like leather) Wrapper is scored for easy folding, with die-cut slits at the sides, Ribbon threads through the wrapper. Invitation card is printed on Italian pearlescent cardstock. Enclosure cards and rsvp set tuck behind the invitation card, secured by the threaded ribbon. Mailing Envelope: Pearlescent champagne custom envelope. Substantial, opaque paper. Four inch flap at top, for an elegant finish. Easy Level: Fairly easy. Wrapper:Handmade cotton rag paper with pearlescent finish and complex crinkle pattern. Scored and die-cut. Envelope:Custom shaped tall pearlescent envelope with deep 4 inch flap. Ribbon:Apricot 1.5 inch wired French ribbon in shimmery apricot. MS Word templates included if you are printing your own.